Time and place : 22nd Nov 2003. 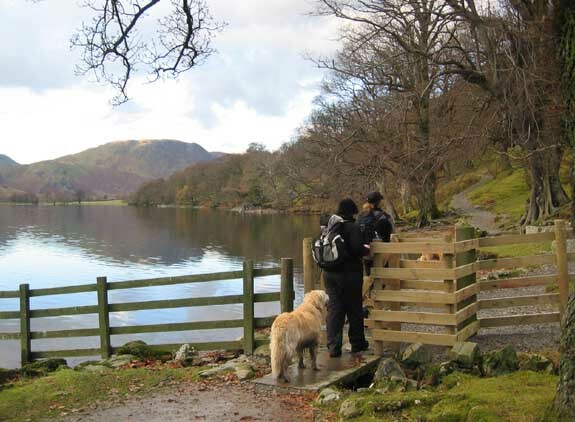 Buttermere "round the lake" walk. Walk details : 5 miles - not a lot of ascent. Weather : Sunny intervals and reasonably warm despite being in the shade at this time of the year. 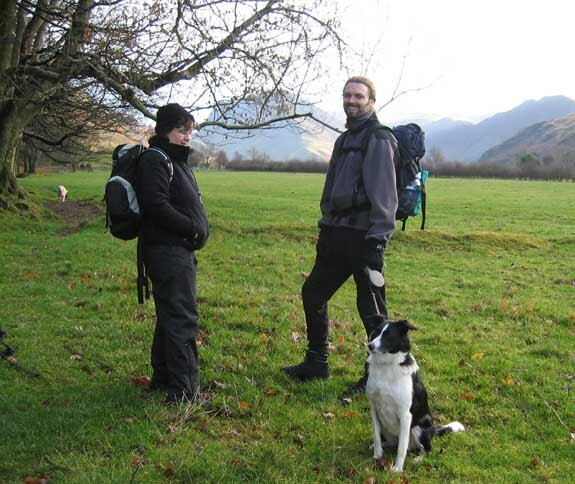 Ben and Sarah were in the Lakes for the weekend with their new dog, a mature boder collie called Jess. She was good company for our two dogs too. 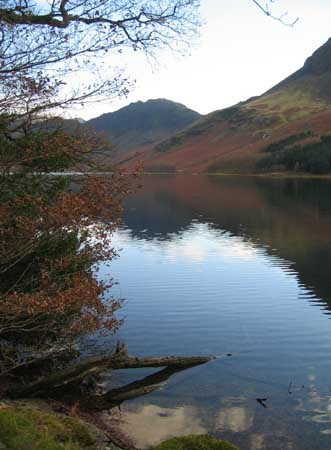 We met at the National Trust car park in Buttermere and rather than walk directly through the village we cut down through the woods virtually to the shores of Crummock Water, before taking a left back past the campsite and into the National Park car park by the Fish Hotel. 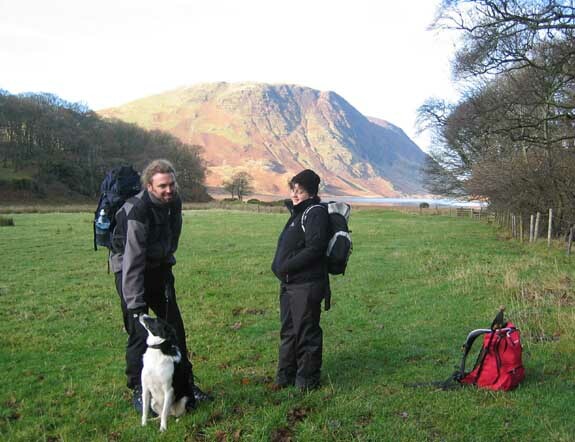 Ben and Sarah and Jess with Crummock and Melbreak behind. Over the beck and left. Fleetwith and Haystacks now dominate the distant skyline. 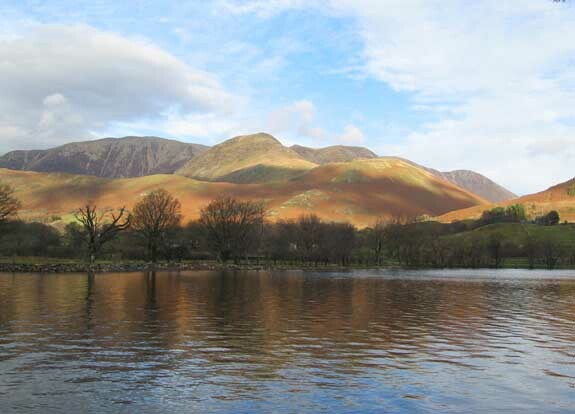 From the western end of Buttermere looking over to Whiteless and Grasmoor. 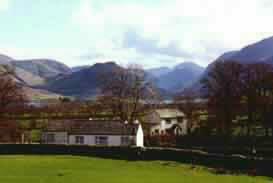 Buttermere village is hidden in the trees. Sunny afternonoon weather gave the lake and the hills a wonderful colour. Reflections . . . almost . . .of the bothy at the head of the lake as we stopped for lunch. Jess has found the way through the gate, but Ben hasn't taught her to hold on while he negotiates the obstruction. The consequence was a bit chaotic. Layla waits patiently for the humans to get themselves sorted ! 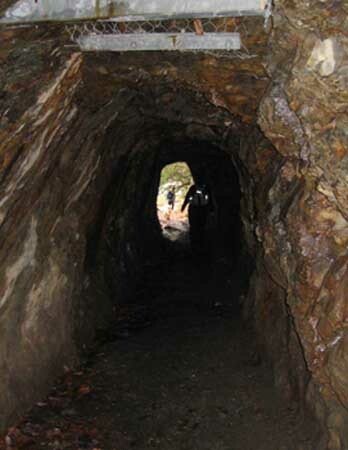 Back down the other side of the lake now, and passing through the tunnel below Hasness. Built as a work creation project in the depression, it avoids a muddy climb over the small headland, and is now an interesting feature of the "round the lake" walk. The ironwork in the roof is a recent feature due to a potential rockfall. 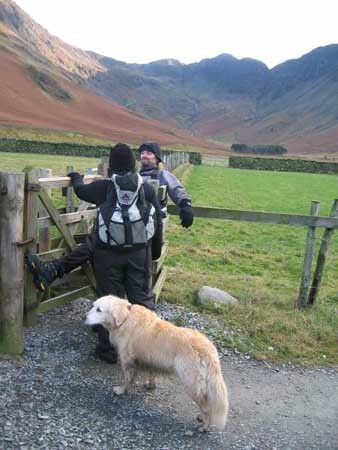 Safely out the other side, and Ben negotiates this gate well . . . Practice makes perfect !! 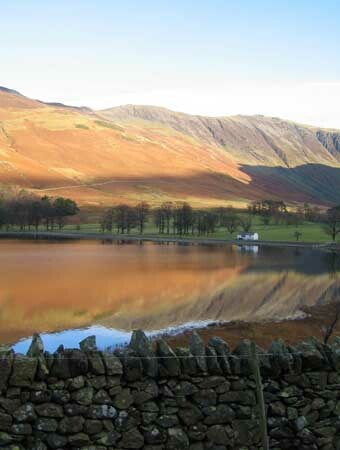 Parting shot of the lake, Haystacks across Buttermere. 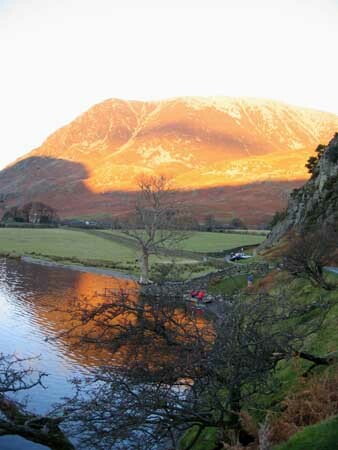 Back to the cottage for tea and cake, but a stop on the way at Hause Point to see the setting sun on Grasmoor. 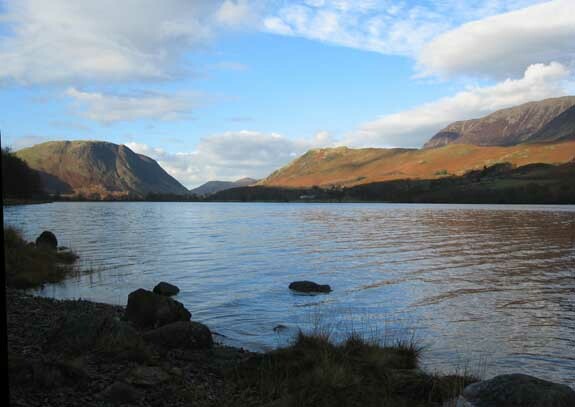 At the side of Crummock the divers are emerging - this is the regular meeting place for a local diving club. Jill B - they have more clothes on than you did when you swam here !! This site best viewed . . . with one eye on sunset times.